It’s almost spring and that means the 2014 Spring Pony Roundup is just about upon us. The 2014 Spring Pony Roundup is scheduled for April 11th and 12th. What’s the 2014 Spring Pony Roundup all about, anyway? Previously known as The Oyster & Maritime Museum, The Museum of Chincoteague houses the story of Chincoteague Island’s fascinating history. Located just outside the entrance to the Chincoteague National Wildlife Refuge on Maddox blvd, The Museum of Chincoteague’s stated mission is to collect and preserve the material culture that reflects the historical progression of the life on Chincoteague Island. And it’s not all just ponies, I can tell you. The islands of Chincoteague and Assateague have a history that is the stuff of seafaring legend, complete with shipwrecks and strandings that belie the peaceful and friendly faces the islands now present to visitors. Take, for example, the January 1650 stranding of Colonel Henry Norwood by his crew on the north shore of Assateague Island. Colonel Norwood and some of his men came ashore in search of food, water, and safe harbor in which they could repair their storm-damaged ship – but the crew remaining onboard got cold feet and scarpered, marooning Norwood’s party to the island’s wilds. Norwood survived to write of the ordeal in his book “A Voyage to Virginia,” a survival ensured in part because of the oysters of Assateague. Chincoteague Island is remote, and that is one of its biggest charms. Not only is it an island – it is an island off the Delmarva Peninsula. The closest major cities, Annapolis, Maryland, Wilmington, Delaware, and Washington, D.C. sit at the tip of the peninsula or on the other side of the Chesapeake Bay. Chincoteague and Assateague Islands. Peaceful. Yet, in spite of its remote location, it doesn’t take all day to reach Chincoteague Island. It’s about three hours from Annapolis, three and a quarter hours from Wilmington, and three and a half hours from D.C. Leave work after lunch on Friday, and you can be at our Chincoteague Island Bed and Breakfast in time for Afternoon Tea. People routinely come to our Chincoteague Island Bed and Breakfast to escape from hectic schedules and non-stop lives. The island is an ideal place to relax, especially during the spring and fall, before and after the arrival of summer crowds. Bring a good book, or borrow one of ours. When was the last time you read Marguerite Henry’s Misty of Chincoteague, inspired by the wild ponies on neighboring Assateague Island? There are many opportunities for outdoor recreation on Chincoteague Island and neighboring Assateague Island: kayaking, canoeing, fishing, hiking and biking. Some of the best activities, fortunately, are also some of the most relaxing. Scenic cruises lead passengers around the perimeter of the Chincoteague National Wildlife Refuge, where the famous Assateague wild ponies live. They are often as curious about people as we are about them, and they sometimes seem to pose for photographs. Picture a wild pony standing on the beach, with the breeze gently lifting his mane. 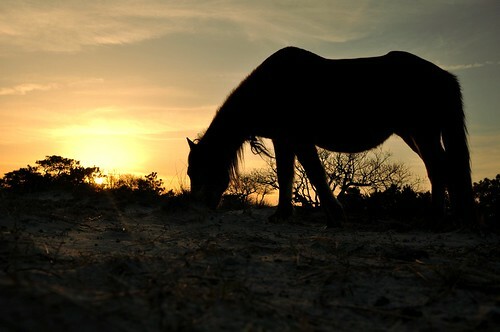 The Assateague National Seashore is an ideal place for beach strolls. Collect shells (unless they are being used as a home), or bring a blanket and a picnic and let yourself be soothed by the sound of the surf. Change your internal clock to Island Time. Our Chincoteague Island Bed and Breakfasts re-open for the season on February 10, 2012. To celebrate spring, we’re offering a Spring Special: stay three nights for the price of two nights, or four nights for the price of three. For more information, please call 800.852.1505.